- освоить порядок прилагательных в функции определения. - развивать умение групповой работы. - пробудить интерес к чтению. - DVD video “Oliver Twist”. Teacher: Good morning, students! Sit down, please. Are you ready? Let’s begin our English lesson. Today we’ll speak about characters and appearance. We’ll review new words describing our friends and characters from American and English books. We’ll learn the order of adjectives before a noun. Учащиеся читают загадку за учителем. Teacher: Say what sounds are repeated in the words. Teacher: Try and read as quickly as you can with correct sounds. (Читают). Teacher: Who knows the answer? Учащиеся отгадывают. (Teeth in your mouth). Учащиеся выбирают соответствующие прилагательные и произносят их. Teacher: Now, open your student’s Books, page 28 Ex. 1. Look at the characters. Who are they? Which books are they from? Describe the people. (Приложение 1). Teacher: Please, listen CD, look at the table of the words (Ex. 2, p. 28). Which words from the table did you hear? (Приложение 2, у автора - превышен объем публикации). Teacher: Listen again and check your answers. Ключи: young, cute, freckles, long, brown, pigtails, old, ugly, thin, short, blond, skinny, elderly, grey, bald, red, tall, dark, curly, shoulder-length, middle-aged, tan, beard, scar, slim, pretty, straight, big, fat, round. Ex: Bob is excellent young American athlete. Teacher: Make your own sentences. Team A S1: Is it a man? Team B S1: Yes, it is. Team A S2: Is he tall? Team B S2: Yes, he is. Team A S3: Has he got dark hair? Team B S3: No, he hasn’t. Team A S4: Has he got red hair? Team B S4: Yes, he has. Team A S5: Is it Bob Cratchit? Team B S5: Yes, it is. Teacher: OK, enough. Try to describe people around you. Be critical, fair and tactful. Mind the order of adjectives. Teacher: I’ll show you a video sequence. The screen will be covered. You must choose words that describe two speakers. Your judgment will be based only on the sound of the voices of two characters. You may use the list of the words on the blackboard and all other words you need for description. I divide the group in two teams. I cover the screen and play the video sequence. I elicit from each team their description and the reasons for their choices. Teams discuss differences of opinion. I play the video sequence with sound and vision. Children compare their guesses with what they see on the screen. Children discuss what team wins. Ученики описывают главных героев отрывка Оливера Твиста и Мистера Брендлоу произведения “Оливер Твист” Чарльза Диккенса, соблюдая порядок употребления прилагательных при описании людей. Teacher: During today's lesson you have got acquainted with some of the characters of the book "Oliver Twist" by Charles Dickens. It's a very nice book. I advise you to read this book! Teacher: I want you to write down your home task in your diaries. Write a short paragraph about your favorite character in a book. 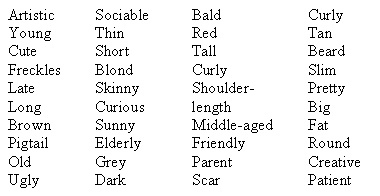 Write name, appearance, character, what is special about him/her, use as many adjectives as you can, but mind the order of adjectives. Teacher: Now it’s interesting to hear your reflection on the lesson? Did you like today’s lesson? What was the most interesting part of the lesson? What was the most difficult for you? Teacher: I wish you good luck! See you next lesson. Приложение 3 - у автора, превышен объем публикации.